The esrp Rail Group specializes in helping companies throughout North America secure rail-served warehouses, manufacturing plants and green field locations. The esrp Rail Group serves the specialized needs of the intermodal, manifest and unit train rail user. 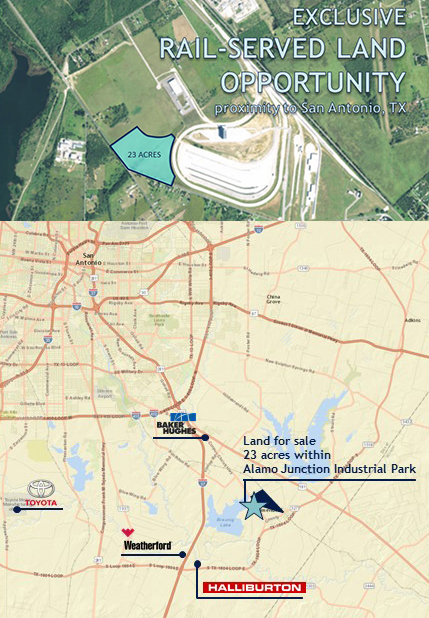 Headquartered in Dallas, Texas, we understand the complexity of finding a rail-served facility or land site. When you choose us, you earn a partner who can locate and pre-qualify sites to your firm’s unique rail-served needs. Knowing the requirements of hoppers, reefers, gondolas, A-Frame, and box cars means we are able to utilize a specialized methodology to quickly deliver rail-served site opportunities. Many companies are sent sites which are not truly rail served and make a real estate decision thinking the site can be rail served. We can reduce time and risk in finding a site. The group can also located and analyze optimal intermodal locations. The drayage is an important factor in determining the total cost of a site. Securing rail sites cannot be done in a vacuum, but needs a team. A key teammate are the actual rail providers, and we integrate them into the process (with clients' express permission). The rail providers really appreciate us involving them and therefore the esrp Rail team has excellent communication and many times can get questions answered quickly. We work hard to maintain relationships with the Class 1 and short lines who know we not only work with qualified rail users, but understand the requirements of the rail line. These relationships ensure the client gets expedited feedback and definitive answers from the rail line. your business needs and executes the transaction in unison. Hire us and you have someone who understands your business, understands your needs and is working in lockstep with you. Market Knowledge: As the real estate market is constantly changing, rail lines don’t have the time or resources to track land and buildings available on their serviceable tracks. Knowing where the products originate or are destined, volume, days of service, and where a rail yard is in a respective city, will dictate what service a client can receive. Understanding the multitude of variables allows esrp to thoroughly search any market to uncover opportunities whether or not they are accurately marked "rail served." Our analysis ensures the chosen real estate matches the clients' specific needs. Work with the Rail, not against it: Understanding the rail lines' current services and commitments is an important factor in qualifying a site. We have seen countless companies buy/lease land or facilities only to find the rail line cannot serve the site; they have wasted immense amounts of time and capital. By aligning the client’s needs with the rail Line’s ability, esrp ensures a win-win solution. Knowing Rail: The average real estate provider/site selector has not devoted years to focusing on rail and therefore does not understand the intricacies of rail-served real estate. Often people assume because a site is currently rail-served, it can be served again – which can be very risky. Three common examples include, (1) a twenty year old spur may have 80lb per yard rails when 100lb per yard or greater is required (2) the switch servicing the lead may have been pulled, rendering that spur worthless (3) the rail line may not be able to service that specific part of town anymore. We have the knowledge to perform the due diligence prior to acquisition, a part of the execution an average service provider usually does not provide. We ask the questions and uncover the advantages or problems others do not know to look for. Therefore, we will not send potential sites and then leave it to the client to determine if the site can meet the clients' rail needs. Resources: In working rail projects we sometimes determine a client does not need its own rail-served facility. Instead we may realize a local transload operator is a better solution. We have relationships with the transload operators and can introduce them to evaluate the cost of their service versus having a rail served facility. In addition we have resources for track repair and maintenance which are very valuable in understanding the cost to activate service at certain locations. esrp Rail Group noticed a void between the users of rail and the various rail lines who service them. The average service provider cannot determine if a site is suitable for a rail user and simply sends any site marked “rail-served.” The client is then left to spend countless hours reviewing and qualifying sites; many of which cannot meet the client’s or rail providers' needs. Months are lost investigating sites that could never be rail-served and many serviceable sites are never found. Worse, sometimes sites are bought or leased only to discover rail service was never possible. Our rail group began to regularly meet with various Class 1 and short-line rail providers across the country. We learned the requirements of the rail providers, when service can be activated, how days of service can be determined and the multitude of other intricacies of rail-served real estate. Equally important, we built trust with rail providers. This trust and understanding of rail service allows for efficient communication with the rail providers, which delivers faster results for you. We meet with the client to understand the product being moved, its origination and destination, and the client’s rail service requirements including, but no limited to, desired rail provider, reciprocal requirements (if any), days of service, demurrage concerns and more. A proprietary search analyzes all sites regardless of if they are listed as rail-served or not. Every site is analyzed to ensure it can meet the specific rail requirements of the client. Prior to presentation to the client, esrp meets with the rail providers to confirm which sites can be adequately served by the rail provider. The client is then presented with a proven list of rail-served opportunities. Don’t waste time and resources on a prolonged search for rail-served facilities. Instead, entrust the best partner for your rail-served requirements, esrp.